It was then covered by a dozen other media sites, but the reporting is mostly weak. The whole thing seems like an industry organization's attempt at humor that went awry when it was picked up and taken seriously by more major media than intended. None of the stories that I read noted that the Innovation Center of U.S. 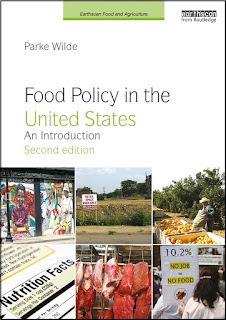 Dairy is a checkoff organization -- part of the network of dairy and fluid milk checkoff organizations loosely overseen by USDA's Agricultural Marketing Service and funded by more than $100 million each year in mandatory assessments that the federal government forces dairy farmers to pay into a common fund for marketing, promotion, and other purposes. The Innovation Center has an interest in educating Americans about real dairy products, so they think well of sweetened dairy beverages (chocolate milk is real milk) and don't think so well of soy milk and other non-dairy alternatives. The Washington Post and other media imply that 7% of American adults are so dim that they think chocolate milk comes from brown cows, because chocolate is the same color as the cow. Before accepting this account of the survey result, we should all demand to read the actual questions and response frequencies, because this may be an exaggeration. 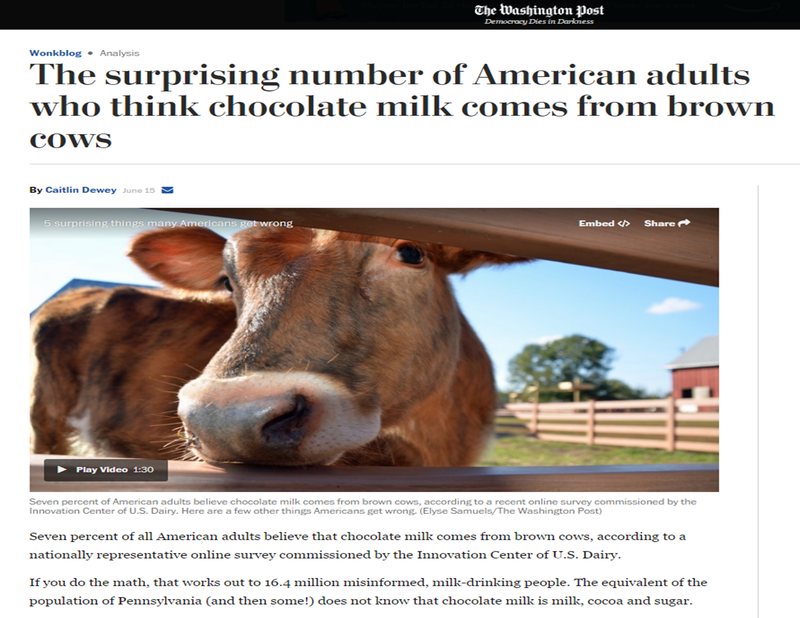 For example, many cows actually are brown, so if the survey question asked whether chocolate milk can come from brown cows, a large fraction of Americans might answer "yes" -- and they would be right. If the survey question was at the end of a long survey and many people were clicking quickly by that point, it is easy to imagine 7% of respondents clicking this response at random. The context would clarify. If you read the NPR version of the story, an interview by Audie Cornish, it sounds as if the interviewee Jean Ragalie-Carr is imprecise about the actual content of the question, leaving a listener to wonder if there was a multiple choice question with non-sensical options. Update: This story originally said the survey in question was commissioned by the National Dairy Council. It was actually commissioned by the Innovation Center of U.S. Dairy, its sister organization. The Post regrets the error. This update made me wonder if one checkoff organization (the National Dairy Council) requested a little more distance from a statistic that another checkoff organization (the Innovation Center of U.S. Dairy) was promoting. The media should go a little slower in sharing a self-serving dairy industry meme, and we should all wait for more information about this survey before taking this result seriously.